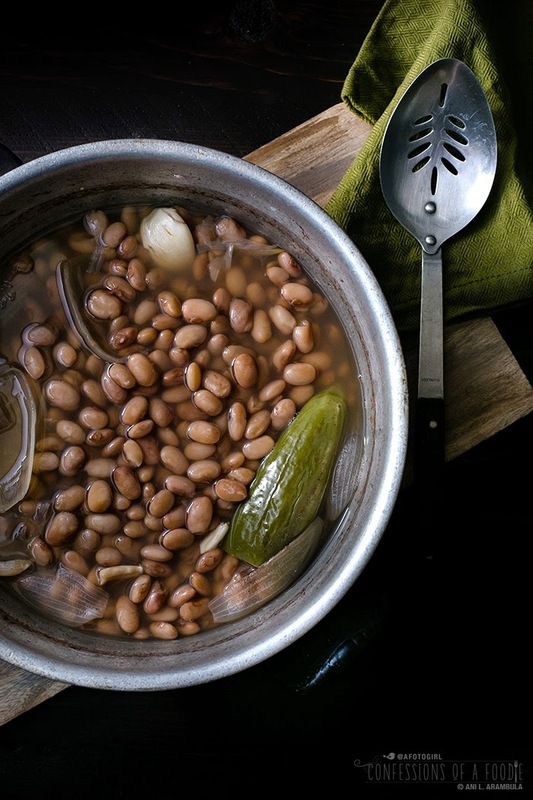 Frijoles de la Olla, a traditional Mexican dish of cooked pinto beans, varies slightly from family to family. However you make it, it's a great recipe for Meatless Mondays. Low calorie, low fat, low cholesterol and filled with fiber, iron, and phytonutrients, a freshly made pot of beans is a healthy protein option for Meatless Mondays. 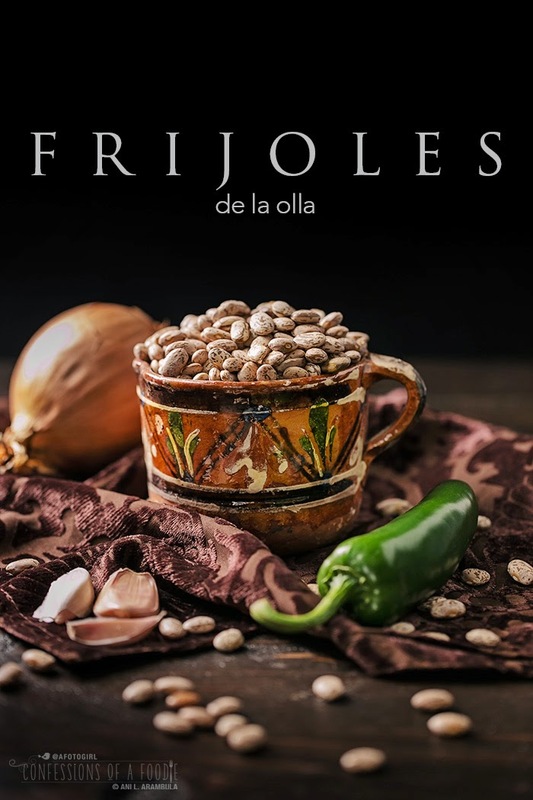 Here, I share with you my take on my family's traditional frijoles de la olla. Before I moved in with my Grandmother and Auntie Syl, Starbuck and I lived in a little 2 bedroom house in Normal Heights. During our evening walks, I always knew when I was walking past a Mexican home by the smell of frijoles de la olla (literal translation is "beans from the pot") wafting through the kitchen, past the dining and living rooms and out into the front yard where Starbuck and I were leisurely strolling by. It's very distinctive, that smell of fresh beans simmering on the stove with chiles and garlic. With just one whiff, I'm a child again, living carefree in the safety of my parent's home enveloped in love. Quite a strong and wonderful thing sensory memory is. In my family, pinto beans are king. To this day, no black beans ever made an appearance on the family dinner table. That's not to say that I don't make them for myself because I do. Often in fact. But I have a particular fondness for pintos. I remember feeling important as a child (maybe as young as 4 years old) because Mom was teaching me to clean beans and roll out flour tortillas, trusting me to help out with the preparation of the family meal. I loved cooking, even back then. Found two peoples amongst the broken and wrinkled rejects. Never skip this step. A broken tooth is no fun! I also have very strong childhood memories of being here at my grandmother's home where a pot of fresh pinto beans on the stove was pretty much a permanent fixture. My Auntie Sally, may God rest her soul, would have me help her clean the beans while we sat at the dining table. She made a game out of it to see which one of us could find the most rocks or broken and wrinkled beans. Only beautiful, smooth, whole beans made it past her. I thought she was being overly fussy because even as a kid, I knew she was a picky eater. Helping mom, we only checked for rocks or beans with holes, only sometimes chucking broken pieces. Little did I know then that Sally's way was more than just aesthetics. Wrinkled beans indicate overly dry and old beans. 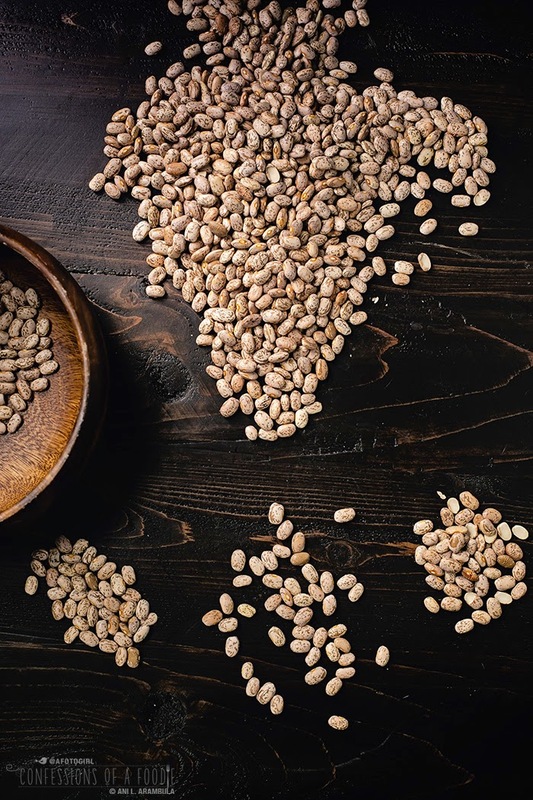 And though they are still edible, they will take much longer to cook than fresh, smooth beans will so throwing them into the same pot will make for inconsistently cooked beans. Ditto broken beans. Beans with holes indicate something has already enjoyed a bit out of the bean so they, too, should be discarded. As an adult, I get sucked into convenience over taste and rely too heavily on canned beans. It's a shame, really, because making fresh beans isn't difficult or time consuming if you plan for it. And the taste and health factor are far superior as you can control the sodium and freshness. Plus, fresh bean stock is freaking delicious! 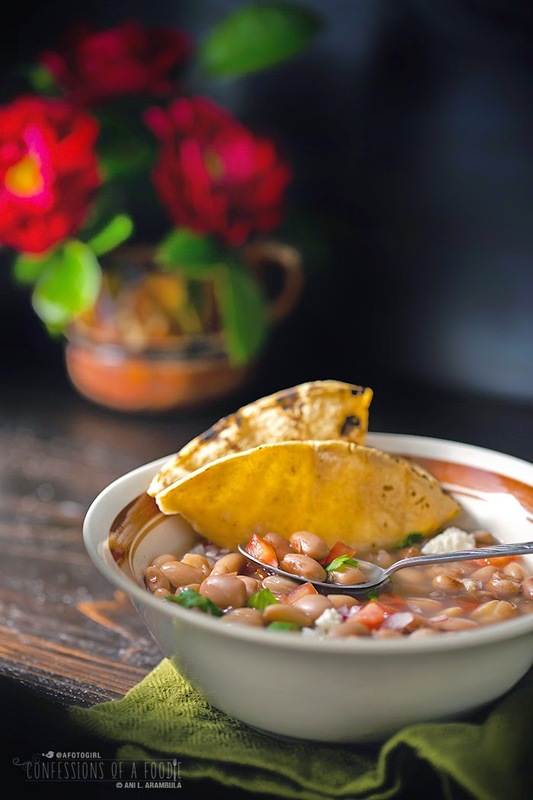 There were many nights while growing up when a bowl of fresh soupy beans topped with chopped onions, tomatoes and cilantro was dinner. Served with fresh, warm tortillas, it's comforting and nutritious. One cup of pinto beans is 245 calories and nearly 45 grams of carbohydrates. However, they are also very high in insoluble fiber –15.4 grams – making them a good choice for diabetics and people suffering from insulin resistance as the high fiber content helps to keep blood sugar levels from rising too rapidly. 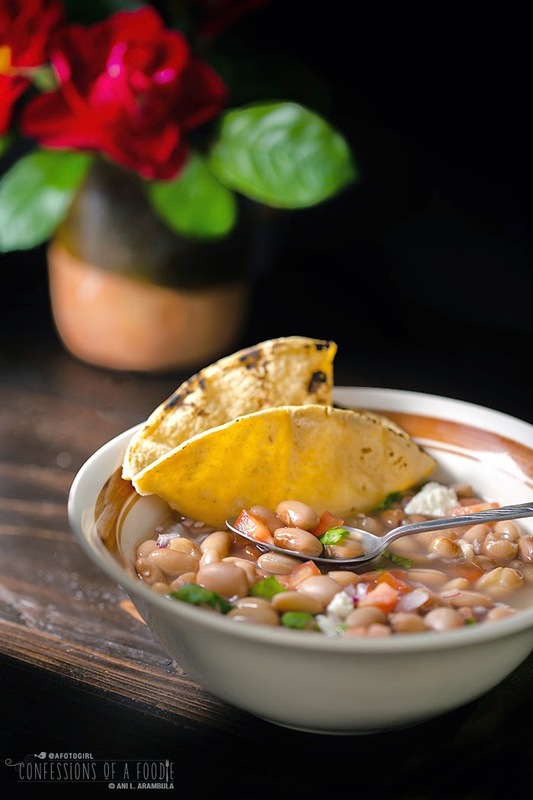 Pinto beans are also a good source of folate (necessary for the production of red blood cells), copper (helps maintain blood volume and convert energy in cells), manganese (for bone structure), phosphorus (bone building), protein, vitamin B1, vitamin B6, magnesium (necessary for nerve and muscle function), potassium (lowers the risk of high blood pressure, stroke, and heart disease), and iron. 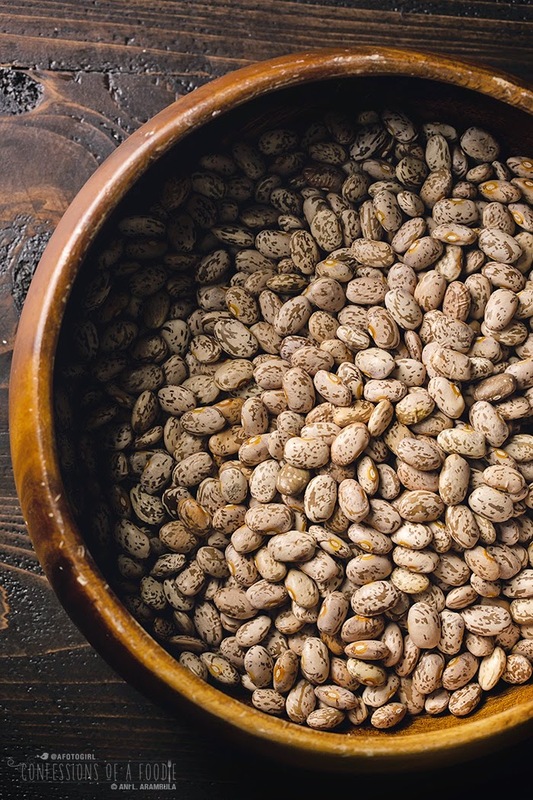 Some studies have also shown that the inclusion of pinto beans in the diet can help lower the risk of cardiovascular disease and certain cancers as well as helping you to lose weight. If you're concerned with the digestibility of beans, soaking them overnight helps. 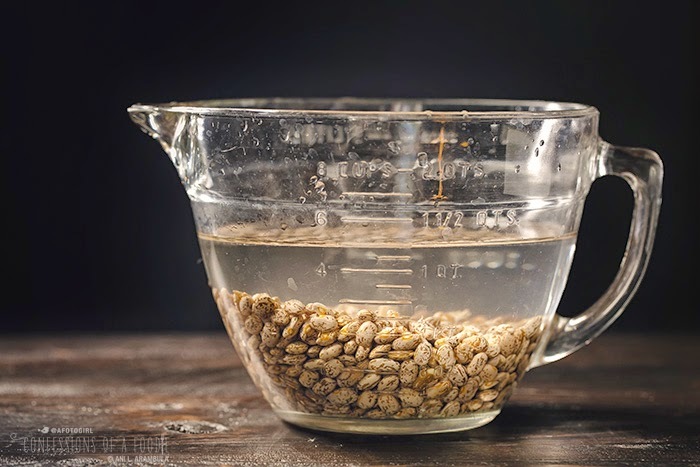 Simply place the beans in water and allow to soak overnight, rinsing them and replacing the water periodically. Even better is to place the beans into a pot of water, bring to a boil, cover, remove them from the heat and then allow them to soak overnight. Soaking helps to remove up to 60% of the phytic acid in the beans that block mineral absorption. When ready to cook, rinse the beans several times and use fresh water to cook them. Soaking also reduces cooking time. There are also some studies that suggest adding bitter greens to the cooking can help digestibility issues. In fact, households in Mexico will add a leaf or two of a bitter green herb called epazote to the pot (dandelion will act similarly, although it won't impart the same flavor that epazote does). Personally, my family never soaked beans and we had no issues. I've included soaking in the recipe but leave it up to you. Not soaking will add as much as two hours to the total cooking time listed in the recipe and you'll need to check the beans every hour to add more water to the pot so the beans are always covered by at least 2 inches of water. 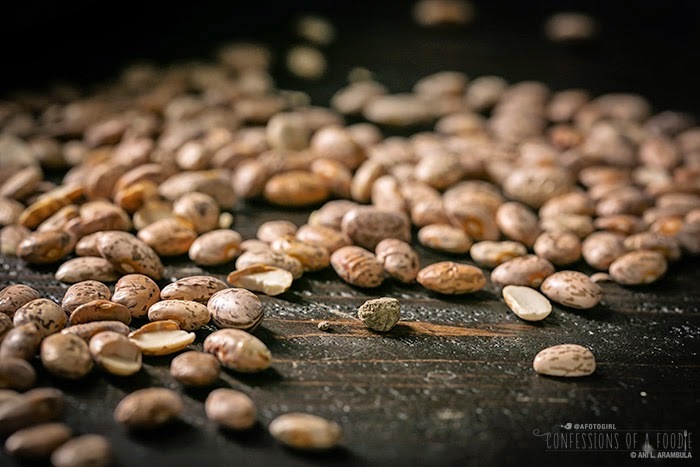 Dried pinto beans are also a very economical way to get good quality protein into your diet and are an especially good choice for Meatless Mondays, or like me, Meatless Fridays during the lenten season. I picked these beans up in a bulk bin at Northgate Market for $0.99 per pound! The jalapeño was $0.23. The tomatos were $1.00. The avocado was $0.79. Two dozen tortillas was $1.99. The cilantro was $0.69. The bay leaves, onion and garlic I already had in my pantry. This feeds 8 people making this a very budget-friendly meal. Spread beans out on work surface a little a time, picking through them, removing any debris, broken beans, beans with holes and beans that are wrinkled or shriveled. Place beans in a bowl or pot and fill with water to cover by a least 2 inches. 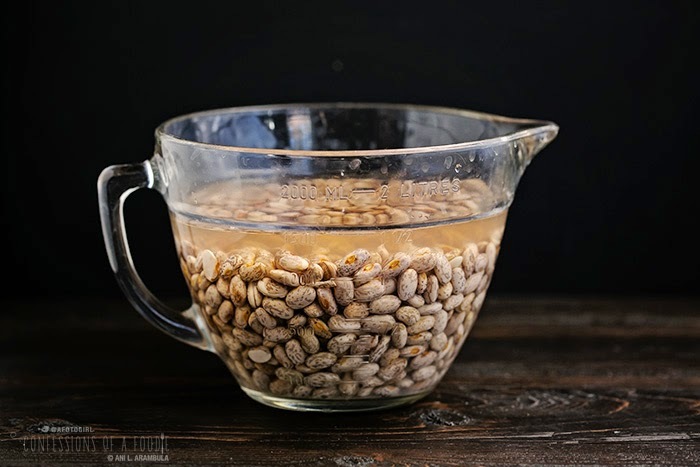 Leave to soak for at least four hours or overnight, draining, rinsing the beans and replacing the water at least once after the first few hours. When ready to cook beans, rinse well under running water. Place beans in a 5 or 6 quart pot and cover beans with water by at least 2 inches. Add the garlic cloves, jalapeño, onion and bay leaves. Turn heat on to medium high and bring just to the boil then reduce heat and simmer on low for 1 hour. At the 1 hour mark, test beans by carefully removing one bean and pinching between fingers. If it gives easily, add the salt and continue to simmer an additional 20 minutes. If the bean is still quite firm, continue cooking, check the beans every 15-20 minutes until just softened. Then add the salt and simmer an additional 20 minutes. While beans are simmering the last 20 minutes, prepare the garnishes. Cut the tomatoes in half, remove seeds and discard seeds; chop tomatoes. Finely chop the onion. Finely chop the cilantro (I don't bother removing the smaller, tender stems). Peel the avocado and thinly slice, then chop. To serve, ladle a cup of beans in a bowl including a healthy serving of the cooking liquid. Garnish with choice of toppings and serve with a warmed corn tortilla. 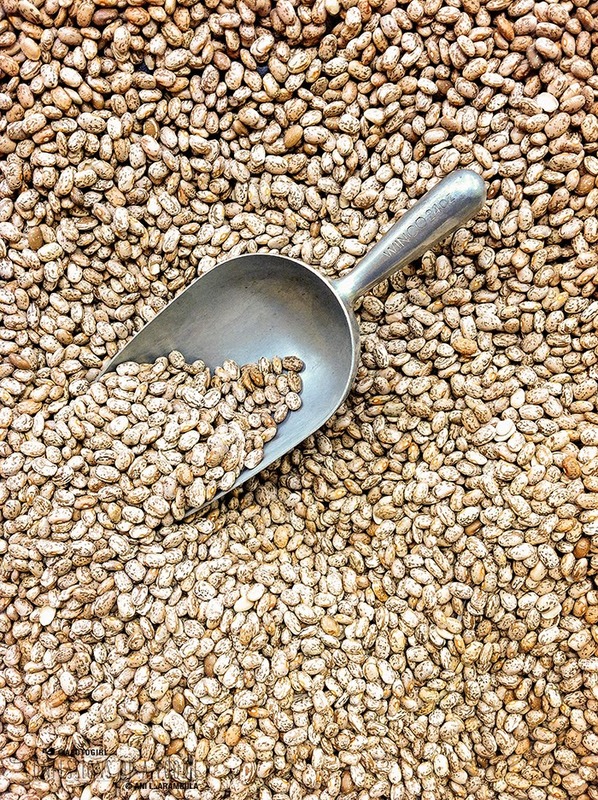 Allow beans to cool completely before storing in an airtight container in the refrigerator. Finish leftovers within three days. Very complete and detailed. However, it is great if you use a pressure cooker to cook them. Do you think you can cook them via smoker? awesome post, thank you for sharing. 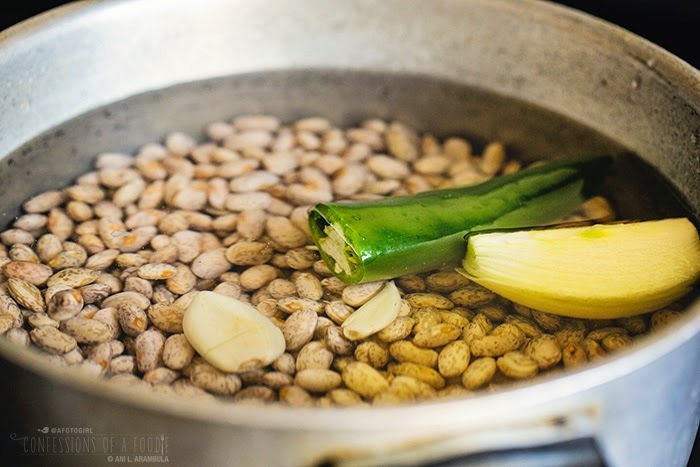 I decided to make frijoles de la olla today and wanted to check your site first for tips on how to do it authentically. So glad I did! Your memories of the aroma and prepping the beans reminded me of 2 summers I lived with a Mexican family in Guadalajara. Every nite there was a pot of beans on the stove and freshly made tortillas. Just can't do canned frijoles and store-bought tortillas. Making them as I type. Added 1# of pork shank. [Don't plan to add salt. ]The house smells mouthwateringly [is that a word? lol] wonderful. Heading out to the store to get a jalapeno. I'll take the seeds out and mince it later to add as I make frijoles refritos. Thanks for sharing this, Ani!